So lovely yesterday, I was able to take my laptop out of doors in order to catch words running away in my sun topped head. Soothing warm it felt, with more upon my face. The old wrought iron swing beckoned me. “Come hither,” it said, squeaking back and forth. All was quiet in the thick green grass of my rolling back yard, except for echoes of my little forest land. From century old trees of weathered stripped bark, acorns fell one by one. “Bombs Away,” they seemed to say. They plopped to the ground, falling on a carpet of crunchy, dried leaves. Fuzzy squirrels of brown patiently waited. Soon puffed cheeks were round and full. Bushy tails scampered away to stash nuts in secret hiding places for the cold of winter ahead. Such a change today! I awoke to splatters of clear rain against panes of glass windows throughout my home. Cooling temperatures had moved in, kicking on the furnace. Glancing out my patio, the garden is all but gone with painted pots of stringy flowers, mostly dead, waiting to be removed. Patio chairs with comfort cushions need to be sheltered in the garage while the umbrella table needs to be covered until spring peeks around the corner again. So sad to see it all go, and yet with each ending there is a new beginning. Something to dream about, hope for, look forward to and aspire to be. Ever changing as we grow wiser with each passing day. The unexpected is always full of surprises. After the rain stopped I went outside to wipe down beige tweed cushions from the swing. One had fallen to the patio, laying on the ground all askew. Bending down and underneath, I marveled at a simple sight not yet seen. Growing through a sliver of invisible dirt with mortar between burnished bricks, a single red petunia stood tall, not ready to give in to the elements. Oh, yes, its green stem, leaves and bright petals were dull and withered from the recent frost. Still, life grew there. Against all odds it rose tall, in the most unexpected place. I wondered then, how long had the flower been? Nature gave it water when dry, shaded it from the sun and kept woodland animals away. Somehow, a tiny seed was whisked away from a potted plant through the breath of God. Or, perhaps one of His creatures, a beautiful bird with feathers spread far and wide dropped it during the dawn of an early morning flight? Either way, it is my own little miracle together with a Life Lesson. Yes, the petunia has withered in its phenomenal growing spot, but next spring perhaps it will be back again? Maybe even to multiply? Allow yourself to hope and dream. Look forward to change together with the unexpected. Wish for what is yet to come. Spectacular surprises of life may lie within. Posted on November 5, 2014 by kcg1974 •	This entry was posted in Nature and tagged Beauty, Change, Dreams, Flowers, God, Hope, Nature, Spirituality, Surprise. Bookmark the permalink. The red petunia is a survivor, Kim! Smiles for this post, I liked your line, endings also lead to beginnings… When it is rainy and cold outside, I try to remember the sunshine always comes back! Smiles! Thank you, Robin. Due to the weather, I was feeling a little blue until I found this red petunia. New perspective on things. Thanks for your support, your time, and lovely comments. Bless you. Fantastic metaphore, Robin! Love to you and your dear daughter, too, with “Hugs” right back to both of you. 🙂 Thank you for your unconditional support. Always here for me which I so appreciate! Blessings. 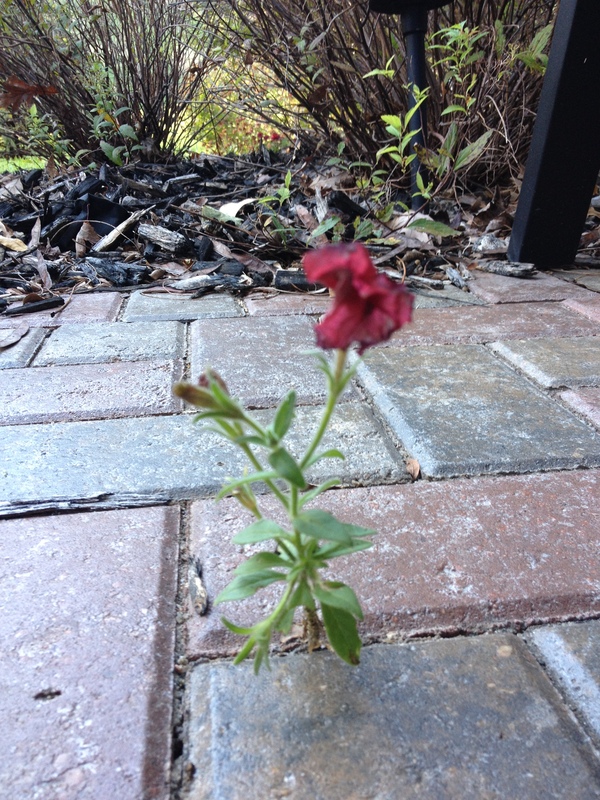 Nature is truely amazing, one little seed that survived all odds to endure and bloom. I have one beautiful flower that must have self sown from a dropped seed, when I was sowing seeds into a pot. The ones in the pot died, yet the dropped seed into the soil survived. I enjoyed your post Kim. Thanks, Ian. Love your little story of the miracle of nature. Everything is a wonder, isn’t it? Thank you again for your time in reading and commenting. Your loyalty means much to me. Bless you. Yes, Petunia offers a lesson to us all. Be well, Kim, and keep writing…. I think the petunia was nature’s offering to a beautiful person. The surprise, to remind her life carries on in unexpected places. Though probably deposited there by the wind, mother nature directed it just for you to find. You’re an exceptional woman Kim, one of those really beautiful people inside and out. David, such a warming compliment that touches me deeply. Not only making my day, but by whole next week too. With love to you. Oh, David, thank you so very much. You are such a kind, wonderful person. Everything you have said applies to you, yourself. However, I am taking your compliment on a much needed day to wrap around myself and warm my heart. With much love to your sweet soul, I thank you. Blessings. Kim Gosselin has a way with words…. and this is no exception. You not only see but also feel and smell everything that she describes. A never-ending supporter who touches my heart and soul with words so kind. Thank you, Sally, for Reblogging this post together with your thoughtfulness. Many thanks to you once again, Rowena. So unexpected and sincerely appreciated. “Demons” in my life sometimes too…wonderful to discover a thriving ‘petunia’ that day. My sign of hope. Love to you. Tess, it “punched” me in all the right places that day.” A picture on my office wall today as a reminder! Thank you as always for your support. Blessings.